July is typically when tomatoes ripen in northern climates. 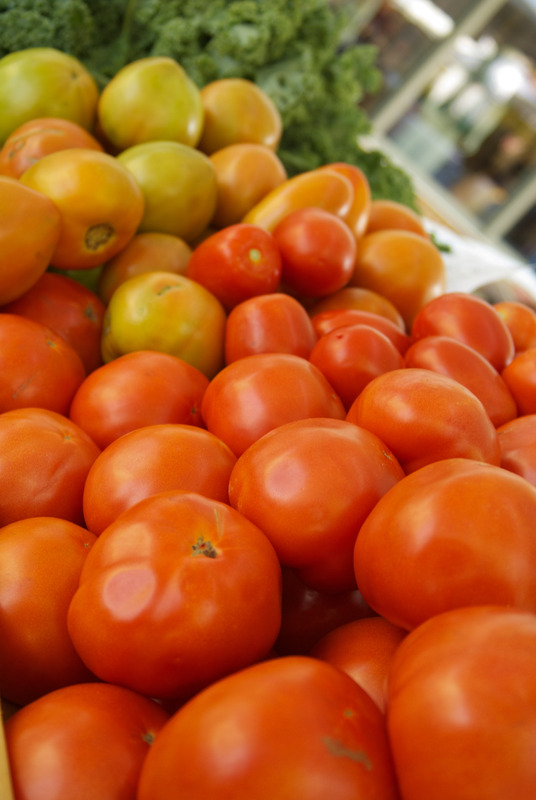 Farmers’ markets are heavily stocked with delicious ripe tomatoes in all types of heirloom varieties. 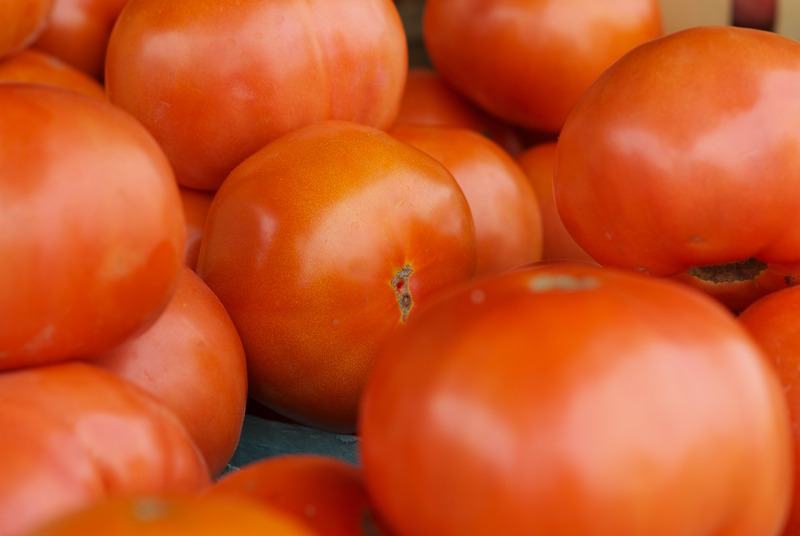 The flavors offered in local fresh tomatoes are a giant leap from what you might find on supermarket shelves because tomatoes are one of many vegetables that taste much better when they are locally sourced or locally grown. Tomatoes also have healing power – especially when you convert them into a delicious sauce, salsa or juice. The medicinal power of tomatoes is primarily attributed to their lycopene content. A red-colored plant nutrient from the carotenoid family, lycopene is one of the most efficient antioxidants; it prevents disease by scavenging and neutralizing free radicals before they can damage cellular structures (Murray, et al., 2005). To a lesser degree, tomatoes also contain beta-carotene, vitamin C, biotin, vitamin K and the flavonols, quercetin and kaempferol (Mitchell, et al., 2004 and Murray, et al., 2005). Although other foods contain lycopene, tomatoes are the most popular source of lycopene in the U.S. diet, so tomatoes and tomato products are widely studied especially for their cancer-fighting potential. Most notably, a 22-year Harvard study showed a 21 percent decreased risk in prostate cancer in men who consumed 6.5 mg of dietary lycopene daily as compared to those consuming less (Murray, et al., 2005). In terms of bioavailability, for the body to fully use tomato’s star nutrient, lycopene, it must be released from the food matrix, that is, all the components of the food and their molecular and chemical relationships to one another. As a carotenoid, lycopene’s chemical structure dictates that it can be released for the body’s use in the presence of fat and when the fiber content of the food is low. Therefore, processed tomato products (tomato juice, tomato paste, etc.) ingested with fat are better sources of bio-available lycopene than fresh tomatoes served with no fat (Gartner et al., 1997 & Brown, 2004). That’s another reason why canning tomatoes and homemade tomato sauces is a great summer activity! You take advantage of local farmers’ fresh, ripe tomatoes, and then add them to make a super nutritious meal on a wintry day. Brown, M. J., Ferruzzi, M.G., Nguyen, M.L., Cooper, D.A., Eldridge, A.L., Schwartz, S.J., and White, W.S. (2004). Carotenoid bioavailability is higher from salads ingested with full-fat than with fat-reduced salad dressings as measured with electrochemical detection. American Journal of Clinical Nutrition 80, 396–403. Gartner, C., Stahl, W., and Sies H. (1997). Lycopene is more bioavailable from tomato paste than from fresh tomatoes. American Journal of Clinical Nutrition 66(1), 116-122. House, P. (n.d.). Top 10 Foods Highest in Lycopene. www.Health.Alicious.Ness.com, Web. 03 Jan. 2014. Wildman, R.E.C. (2006). Handbook of nutraceuticals and functional foods (2nd ed.). CRC Press: Boca Raton, FL. Google eBook.